Apparently on a baking spree today. Not only did I make Chocolate Chip & Pecan Muffins [from scratch] for breakfast today, but then I also made homemade [from scratch] cookies with chocolate chips and M&Ms in them. I don’t know anyone who doesn’t like a) cookies b) chocolate and c) M&Ms. So a combination of all three? Yum! Preheat oven to 325 degrees. Line your baking tray with foil or parchment paper. Beat together the butter and brown sugar until well combined. Beat in the eggs and vanilla. Add in the flour, cornstarch, baking soda, and salt. Mix just until everything is combined. Add the chocolate chips and the M&Ms. 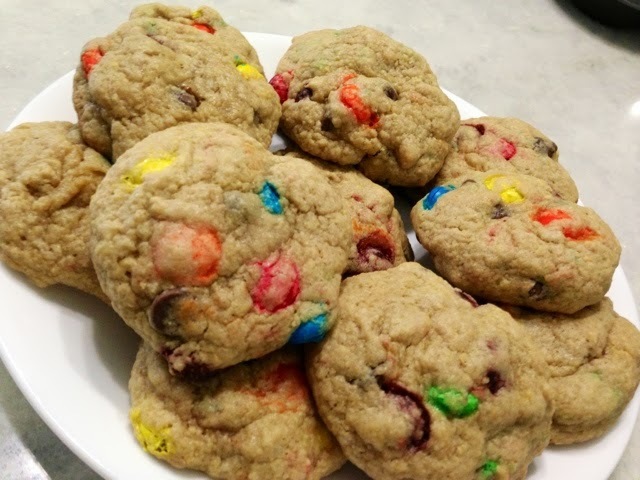 Tip: I think next time, right when they come out of the oven, I’ll sprinkle in more M&Ms on top so the colors pop.